If you've ever traveled abroad, you know just how much the value of your dollar can stretch -- or shrink -- in another country. Coming from the States, you can live like a royal when you spend time in relatively cheap vacation-worthy locales like Portugal or Estonia by indulging in nice meals, good booze, and comfy accommodations without blowing a crazy through your savings. But how exactly does the cost of food compare around the world? 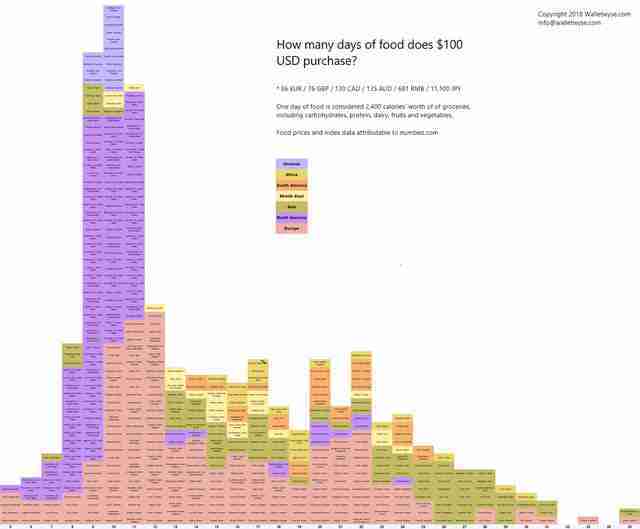 It's a lot easier to visualize thanks to this nifty new chart that shows how far $100 goes to feed a single person in dozens of cities around the globe. The colorful comparison was put together by the team at financial literacy site WalletWyse, who looked at a whole bunch of cost of living data from Numbeo, and charted cities out according to how many days a person could nourish themselves for by spending only $100. Specifically, one day of food was considered 2,400 calories worth of groceries (and included carbs, protein, dairy, fruits, and veggies). Not to overstate the obvious, but the amount of time you can last on such a relatively modest sum is enormous. Basel, Switzerland is the priciest city, where $100 can get you just five days worth of food, while the same amount of money can feed you for over a month (35 days) in Sumy, Ukraine. 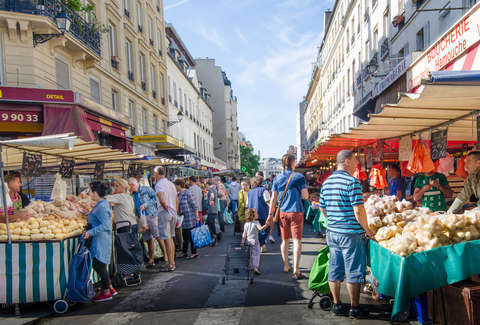 The most common length of time $100 will set you up for is 10 days, which is as long as you can expect to eat in places like Tel Aviv, San Diego, Dublin, and Singapore. Unsurprisingly, Asia and Africa are home to the cities where the US dollar goes furthest, while North America is the priciest continent for groceries, by quite a margin. As for how American cities compare, Anchorage, New York, and San Francisco are the most expensive, with $100 lasting just six days. You can expect to eat for 11 days in cities like Dallas, Detroit, and Phoenix, which are among the cheapest places in the States, food-wise. Just one more thing to consider before booking your next super cheap vacation.